Run the setup program and follow the installation instructions. HIGHLY RECOMMENDED - Right click the setup program and "Run as Administrator"
The PocketWizard Utility is now installed in your Start Menu. Find it there and run it! You can delete the setup program. HIGHLY RECOMMENDED - Right click the program and "Run as Administrator"
The connected radio will be displayed in the top left of the Utility window. Note the current Firmware Version of the connected radio. If the Firmware Version matches the Current Versions listed below, skip steps 5 to 9 and proceed to the next radio. Under the Update Tab, click "Update Firmware", which will download the latest firmware version, and prompt to update the firmware in the connected radio. The Utility will update the firmware in the connected radio. Do not disconnect the radio while the progress bars are visible. After the Utility confirms a successful firmware update, disconnect the radio from your computer. Repeat the above steps for all of your radios, making sure all firmware versions match the Current Versions listed below. Note the current Firmware Version of the connected radio. If the Firmware Version matches the Current Versions listed below, skip steps X to X and proceed to the next radio. Under the Update Tab, click Check for Updates, which will download the latest firmware version, and prompt to update the firmware in the connected radio. After the Utility confirms a successful firmware update, disconnect the radio from your computer, and move the power switch off. Perform a Factory Reset of your radio, by holding the TEST button as you power on the radio. Perform a Factory Reset of your radio, by holding the C key as you power on the radio. Information about current Beta firmware (if any) is available here. For the radio that will be used as the transmitter attached to your camera, change the Camera Model setting to match the camera the radio will be attached to for Configuration C1. 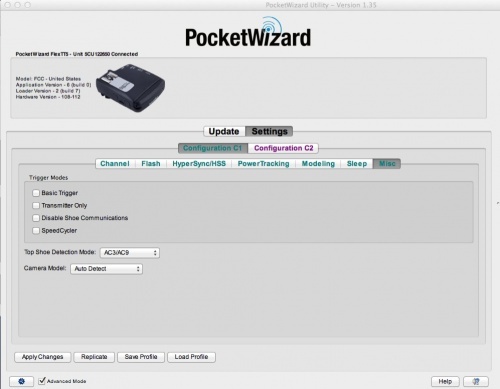 This setting is located under the Misc tab when your radio is connected to the PocketWizard Utility. Make sure to Apply Changes in the bottom left of the Utility window after applying this setting. Once the radio has briefly disappeared and reappeared in the Utility window (which confirms the settings have been applied to the radio), you can disconnect the USB cable. This step is only required once, or when the camera model changes. Turn the Speedlite on, and set it to ETTL - don't use "Master" or "Slave"
Set your camera to use Auto-FP. On most Nikon Cameras, this is Custom Function e1, located under the Pencil menu. This setting should be set to the slowest shutter speed with the "(Auto FP)" option. Most Nikon cameras will use "1/250 (Auto FP)", although some will be 1/200 (Auto FP)". Connect your receiving flashes to their respective FlexTT5's. Turn the flash on, and set it to the normal TTL mode - NOT "Master" or "Slave" mode. Then, turn the FlexTT5 on to Configuration C1. Within a few seconds, a low power flash will be emitted from the directly-connected flash, confirming the flash and FlexTT5 are communicating through the hotshoe properly. Connect the transmitting MiniTT1 or FlexTT5 to your camera. Turn the radio on to Configuration C1. Turn on the camera, and set to 1/160th shutter speed. Take a test shot with the camera at this shutter speed - the remote flash will fire, but may not sync properly (this is a Calibration Shot for the radio). Take a second test shot, and your remote flashes will fire a TTL exposure! Step 1 is only required once, or when you set up a new camera. The normal power-up sequence is Steps 2-4. Connect your PowerST4 to your remote Elinchrom Flash, and power on the flash unit. The radio will power on when the flash is turned on. Follow the above instructions for starting up a Canon or Nikon transmitting radio. You will now be triggering your PowerST4! Use the in-camera Flash Exposure Compensation settings to adjust the power levels. You can also use your AC3 or Canon / Nikon master flash controls to adjust the manual power level of the connected flash. See the respective links above. Connect your PowerMC2 to your remote Einstein flash, and power on the flash unit. The radio will power on when the flash is turned on. Use the Einstein's LCD to change the Channel and Zone settings to channel: "CTL-01" and "Zone A"
You will now be triggering your PowerMC2! Use the in-camera Flash Exposure Compensation settings to adjust the power levels. Power on the remote radio, the remote flash, and the transmitting radio. Ensure the Plus III/IV's are set to TxRx mode, or for a MultiMAX that the transmitting radio is set to Transmit, and the receiver to Receive mode. Set the Channels and Zones to match. Take a test shot, or press the TEST button, and the remote unit will fire! This page was last modified on 10 November 2017, at 10:03. This page has been accessed 760,117 times.